On October 13th, 2014, the Lunar Reconnaissance Orbiter (LRO) experienced something rare and unexpected. While monitoring the surface of the Moon, the LRO’s main instrument – the Lunar Reconnaissance Orbiter Camera (LROC) – produced an image that was rather unusual. Whereas most of the images it has produced were detailed and exact, this one was subject to all kinds of distortion. From the way this image was disturbed, the LRO science team theorized that the camera must have experienced a sudden and violent movement. In short, they concluded that it had been struck by a tiny meteoroid, which proved to a significant find in itself. Luckily, the LRO and its camera appear to have survived the impact unharmed and will continue to survey the surface of the Moon for years to come. The LROC is a system of three cameras that are mounted aboard the LRO spacecraft. This include two Narrow Angle Cameras (NACs) – which capture high-resolution black and white images – and a third Wide Angle Camera (WAC), which captures moderate resolution images that provide information about the properties and color of the lunar surface. The NACs works by building an image one line at a time, with thousands of lines being used to compile a full image. In between the capture process, the spacecraft moves the camera relative to the surface. On October 13th, 2014, at precisely 21:18:48 UTC, the camera added a line that was visibly distorted. This sent the LRO team on a mission to investigate what could have caused it. Led by Mark Robinson – a professor and the principal investigator of the LROC at Arizona State University’s School of Earth and Space Exploration – the LROC researchers concluded that the left Narrow Angle Camera must have experienced a brief and violent movement. As there were no spacecraft events – like a solar panel movement or antenna tracking – that might have caused this, the only possibility appeared to be a collision. To test this, the team used a detailed computer model that was developed specifically for the LROC to ensure that the NAC would not fail during the launch of the spacecraft, when severe vibrations would occur. With this model, the LROC team ran simulations to see if they could reproduce the distortions that would have caused the image. Not only did they conclude it was the result of a collision, but they were also able to determine the size of the meteoroid that hit it. The results indicated that the impacting meteoroid would have measured about 0.8 mm in diameter and had a density of a regular chondrite meteorite (2.7 g/cm³). What’s more, they were able to estimate that it was traveling at a velocity of about 7 km/s (4.3 miles per second) when it collided with the NAC. This was rather surprising, given the odds of collisions and how much time the LRO spends gathering data. It was only after the team deduced that no damage had been caused that prompted the announcement. According to John Keller, the LRO project scientist from NASA’s Goddard Space Flight Center, the real story here was how the imagery that was being acquired at the time was used to deduce how and when the LRO had been struck by a meteoroid. In addition, the impact of a meteoroid on the LRO demonstrates just how precious the information that missions like the LRO provides truly is. Beyond mapping the lunar surface, the orbiter was also able to let its science team know exactly and when its images were comprised, all because of the high-quality data it collects. Since it launched in June of 2008, the LRO has collected an immense amount of data on the lunar surface. The mission has been extended several times, from its original duration of two years to the just under nine. Its ongoing performance is also a testament to the durability of the craft and its components. OMG – breathtaking! That was my reaction when I clicked on this incredible new interactive map of the moon’s north polar region. Be prepared to be amazed. It took four years and 10,581 images for the LROC (Lunar Reconnaissance Orbiter Camera) team to assemble what’s believed to be the largest publicly available image mosaic in existence. With over 650 gigapixels of data at a resolution of 2 meters per pixel, you’ll feel like you’re dropping in by parachute to the lunar surface. Wide view of the 91-km Karpinskiy Crater from the new interactive north pole mosaic. See image below for a zoomed-in view. Credit: NASA/GSFC/Arizona State Univ. When you call up the map, be sure to click first on the full-screen button below the zoom slider. Now you’re ready for the full experience. With mouse in hand, you’re free to zoom and pan as you please. Take in the view of Whipple Crater shadowed in polar darkeness or zoom to the bottom of Karpinskiy Crater and fly like a bird over its fractured floor. In this photo, we come in for a closer look at the fracture or rill in Karpinskiy’s floor. Notice the small, lighter-toned boulders on the cliff side. The images were all taken with the Lunar Reconnaissance Orbiter’s Narrow Angle Camera (NAC). Credit: NASA/GFSC/Arizona State Univ. The images are so detailed and the zoom so smooth, there’s nothing artificial about the ride. Except the fact you’re not actually orbit. Darn close though. All the pictures were taken over the past few years by NASA’s Lunar Reconnaissance Orbiter which can fly as low as 50 km (31 miles) over the lunar surface and resolve details the size of a desk. There are 10 snapshots along the bottom of the map – click them and you’ll be swiftly carried directly to that feature. One of them is the lunar gravity probe GRAIL-B impact site. To create the 2-D map, a polar stereographic projection was used in to limit mapping distortions. In addition, the LROC team used information from the LOLA and GRAIL teams and an improved camera pointing model to accurately project each image in the mosaic to within 20 meters. For more information on the project, click HERE. OK, I’ve said enough. Now go take a look! At the 2012 Lunar Science Forum going on this week at the NASA Lunar Science Institute, scientist Mark Robinson presented some new stunning images from the Lunar Reconnaissance Orbiter’s cameras (LROC), including this oblique view Giordano Bruno crater, and a wonderful video (below) that allows viewers to “barnstorm” over the crater to witness the stark beauty of this impact basin. Robinson is the Principal Investigator for LROC, and in his talk today said all systems on LROC are working nominally. “That’s NASA-speak for everything is fantastic,” he joked. Just about every month, the science team is able to take new mosaics of both the north and south pole, and they’ve also found 160 pits – lunar caves – so far. These caves with “skylights” are intriguing because they would offer potential protective habitats for future lunar explorers. Now in its extended mission, LRO is still going strong, and has provided incredible details of the lunar surface. LRO project scientist Richard Vondrak said since the start of the mission, LRO has uploaded 325 terabytes of data into the Planetary Data System, the digital storehouse for NASA science mission, through June 2012. “Thanks to LRO, the Moon’s topography is now better understood than the Earth, since two-thirds of Earth is covered by water,” Vondrak said. But both scientists agrees LRO is just getting started. 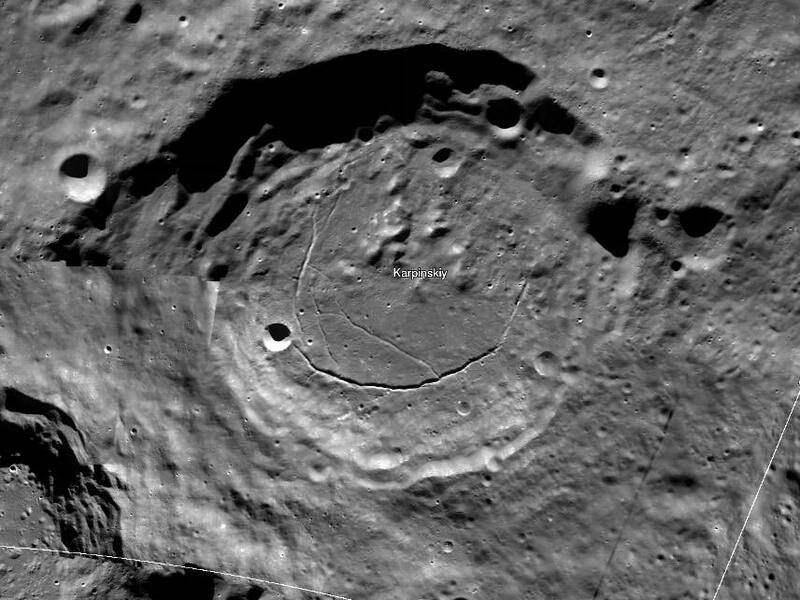 Robinson suggests scrolling through all of the details of this beautiful impact crater by looking at the full-resolution version of Giordano Crater — “not to be missed!” he said. Also, the full resolution version of the video can be downloaded here.